Peter G. Shilston's Blog: Relations with Islam: how things have changed! 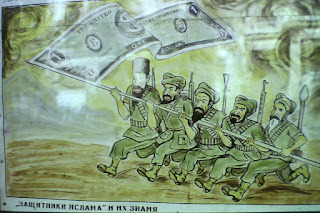 This is a propaganda poster which I saw on a visit to the Soviet Union back in 1984. 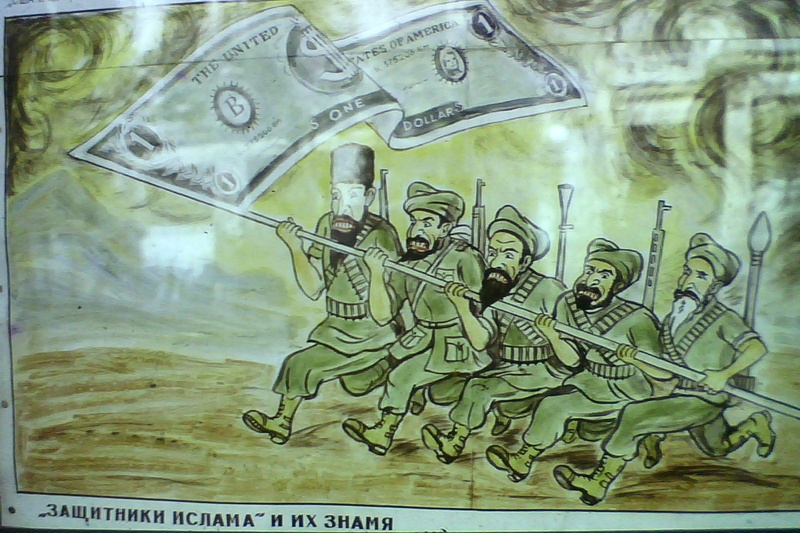 In those days the western powers were arming Islamic fighters in the war to drive the Communists and their Soviet mentors out of Afghanistan: so here we have Mujahadeen warriors, all of whom look very like Ousama bin Laden, charging beneath their banner, which is, of couse, the dollar! (My Russian isn't up to translating all the caption: can anybody help?). The anti-communist campaign was successful. After heavy losses, Gorbachev withdrew the Red Army and in 1991 the Soviet Union disintegrated; the Afghan disaster having played no small part in the collapse. In Afghanistan itself the Communist government was overthrown, and soon afterwards the Taleban came to power, with results that are familiar to us all. How different things are now! I cannot help but ponder that if our aims in Afghanistan were to stop the heroin trade and curb militant Islamic fundamentalism, we should have left the Communists in control. They would have dealt very effectively with opium growers and people who wanted to stop little girls from going to school: they'd have shot them! But our priorities were very different back in the 1980s! "DEFENDERS OF ISLAM" AND BANNER.